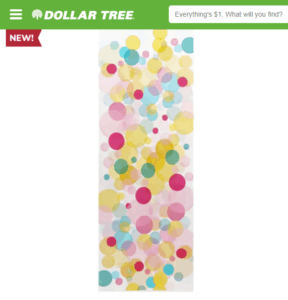 The new Dollar Tree Peel and Stick Poster Stickers are beautiful. Just two days ago, on Wednesday, I came across them and am already considering some of them as a Washi Tape Alternative for embellishing the back of my envelopes with my letter writing. 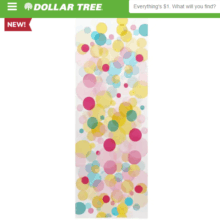 The really great thing is we can see each of the patterns online available for ordering. The Bubble Pattern is available for ordering in a bulk quantity of 24 of them. Width: 5.875 in. ; Height: 18 in. Be sure to also check out their Peel and Stick Colored Thought Bubbles Poster Stickers. It immediately has me thinking of the Jot Neon Starbursts I was blogging about and using with InCoWriMo 2019. And I’ll probably do a blog post about it, in the meantime, you can be ahead of things if you want to look and see now – see if you don’t think they are too much fun to use together! 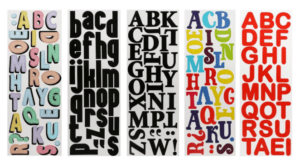 The Peel and Stick Poster Stickers assorted 5 pack letters designs, SKU: 200292 is available for ordering in bulk of 36. It gives the dimensions there too. As far as wrapping up the month of March, we have today through Sunday. If there are any items have been thinking about getting done during the first quarter of 2019 now is the time to finalize and complete! Join me tomorrow for my Saturday blog post. And just think – this Monday is April 1, April Fool’s Day – no kidding! P.S. Today is blog post #1493! The countdown to AnchoredScraps #1500 daily blog posts continues!